The South Fork American River is the ideal outdoor whitewater rafting adventure for families. Enjoy the fun and excitement of whitewater rafting with your kids in the outdoors while creating wonderful memories of time spent together on the river. Your kids will develop an appreciation for the great outdoors, get to know the wonders of nature, and have a terrific fun time. 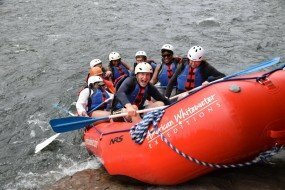 Our whitewater rafting guides are enthusiastic, safety conscious, and looking forward to introducing your family to the thrills of whitewater rafting. We’ll take good care of you and your kids on these special family fun trips. Families can also enjoy the Class 3 and Class 4 Middle Fork Rafting Combo at the special Family Midweek price. This trip is a great experience for those families with children who are 12 years of age or older. Only American Whitewater’s campground is able to offer your children such fun-filled activities as fishing in a trout-stocked pond, swimming in the pool, and playing volleyball and horseshoes. Plus, Troublemaker Rapid, where you can watch dozens of rafters paddle their way down the biggest rapid on the South Fork, is just a 2 minute walk from our campground. Spend an afternoon exploring James Marshall Gold Discovery State Park which is only a 5 minute walk. There is no fee to enter the park if you walk. Learn all about the History of the Gold Rush with an afternoon spent in this historic area. Midweek river trips offer an opportunity to experience rafting at a slower, more relaxed pace, with fewer people on the water, the same great food, and all at a lower price. You can even stay an extra day at our South Fork campsite ($10 per person per day midweek and $20 per person Friday or Saturday) while you see the sights in the heart of the Gold Rush country including quality restaurants in Placerville and Auburn, parks and antique stores. 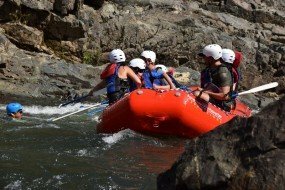 Combine your rafting adventure with a visit to Sacramento, Tahoe or San Francisco, or enjoy the local sights and history just minutes from our camp. You’ll want to book your midweek trip early. Try a weekday escape this season and find out for yourself why midweek trips are so enjoyable. It can become a habit! Adults paying full fare can take ONE CHILD PER ADULT for half that rate and additional children at a special reduced price. Prices are per person. 4-person tent rentals (set up before you arrive) are FREE! Save $20 on one-day trips and $28 on two-day trips! You’ll really appreciate the slower midweek pace and the special attention you’ll receive. An 8% Government Land & River Use Fee is added to all trip prices. No other discounts or specials apply. South Fork trips: Minimum age is 6 years. Middle Fork trips: Minimum age is 12 years. Youth Prices are for ages 6 – 16.